The Apache CXF framework helps you to develop web services using standards based programming model and also provides a flexible deployment model for deploying web services. Developing SOAP and RESTful applications can be made easy by using Apache CXF framework. However, getting started with developing web services using the Apache CXF framework is not easy. 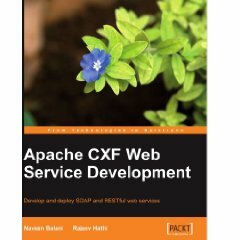 This is the first book that gives details on how to use the Apache CXF framework for developing SOAP and REST web services. It is a hands-on practical guide that simplifies working with CXF framework as it covers all major aspects with real-world examples. The chapters cover the various CXF features in detail and each has systematic steps with practical, simple examples to implement these features on your web services. The book introduces the Apache CXF framework and its features such as Frontend API, Data Bindings, Transports, Spring-based configuration, and CXF tools. It also has chapters on SOAP and RESTful services. It will help you create RESTful services that support XML as well as the widely accepted Java Script Object Notation (JSON) format. It explains the components of CXF architecture that help developers customize the Apache CXF framework to suit the target application. The book covers both code-first and contract-first approaches for service deployment. You will see how to develop services in a flexible deployment model offered by CXF, unit test them in a stand-alone environment, and finally promote them in an application server environment. The instructions in this book will help developers to build their application according their requirements by using any of the frontends supported by Apache CXF framework. The various CXF frontend APIs covered in this book provide a wide variety of options in developing and deploying your application. The book introduces some advanced concepts such as Interceptors and features that will add extra capability to your service component. It will help you take advantage of different transport features offered by the CXF runtime such as HTTP, HTTP(S), and JMS protocols.